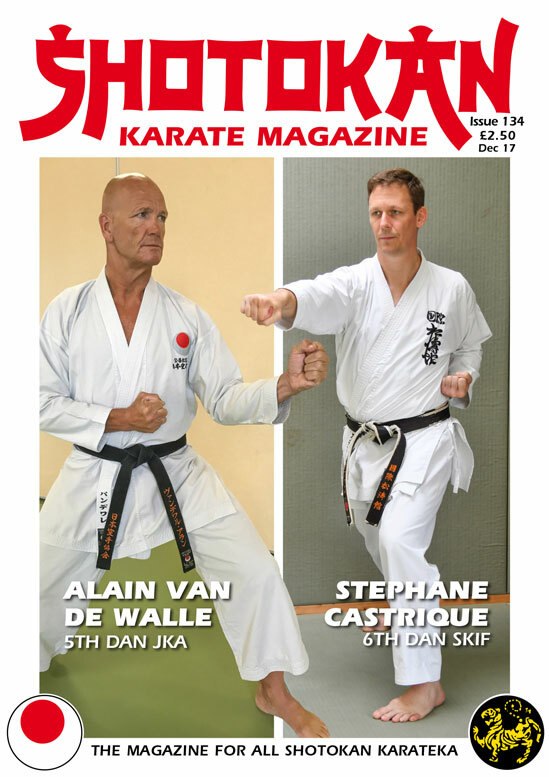 You’ll see that we have two interviews in this edition both with senior instructors from Belgium, one from SKIF and the other from JKA. For such a small country, Belgium has produced some excellent karateka over the last 40 years. There are two extremely valid articles in this edition which focus on what you could term, close-range, practical street self-defence karate. Namely the articles by Graham Palmer and Andy Allen. However, it’s a pity that these days 3K’s karate and practical self-defence karate are spoken of as if they can’t be practised in unison. I think it’s all about personal preference. Some people prefer the percussive approach e.g. punches, various strikes, knees, elbows, kicks etc, (most ladies for example, would hardly want to be grappling or trying to put an arm-lock on a 200lb assailant!!). Others prefer to work on close-range self-defence, arm-locks, ground-work etc., so called practical karate (?) It’s all self-defence! Originally karate encompassed all the various types of training; be it individual techniques (you could term basics) using makiwara and sand-bag etc., bunkai/oyo (as kumite), close-range, long-range, grappling or whatever. It was all part of the karate whole. Nowadays, I think that people have different training preferences and it’s all self-preservation when it boils down to it. If you have to defend yourself, it’s fighting whether the encounter ends on the floor or with the first punch, it’s a veritable minefield! Many dojo who focus on practical self-defence karate, tend sometimes to overlook the fact that early kyu-grade students (e.g. below brown-belt) definitely need serious basic training. You could argue, that they need a heavy dosage of 3K’s training before attempting more complex close-range work. When doing very close-range kumite or kata bunkai, the average green/purple-belt and below can struggle, it’s quite obvious that it’s far too early in their karate development and education! They are not at this level yet. They have insufficient experience to do this type of work effectively. All the top senior instructors who are now teaching karate based on street self-defence have nearly always had a very long and very thorough grounding in basic training, e.g. what we call, the 3K’s. To be really effective at any physical endeavour, you have to have a strong basic foundation to work from, be it martial arts, golf, football, tennis, athletics, any physical sport/art you wish to name. Kata bunkai has no written rules or guidelines, there’s no definitive answer to what a movement actually was intended for, it’s pure conjecture. There are varying concepts. A good example is the analysis of the Shotokan blocks; uke waza, as described and demonstrated in Andy Allen’s excellent article in this issue. Paul Mitchell’s article is a gem in my opinion. His profound hypothesis of the principle involved in the so-called basic (?) kata (Taikyoku shodan or Kihon kata) is to me refreshingly original and different. As a studier of the martial arts for something like 35 years, many of them spent training in the Shotokan style of karate, I am sometimes amazed and often dismayed by the lack of thought that appears to me to be applied by the vast majority of my fellow followers of the way of karate-do when it comes to the analyzation of their particular style or system. I suppose some karateka may take exception to this remark, but they shouldn’t as this is only my opinion. I have many opinions that do not conform with the mainstream of the karate world. I dislike the notion of karate-do being what I consider downgraded to a sporting activity, from its original status as a genuine Budo. It is again only my opinion when I state that Funakoshi’s art was highjacked by the sporting fraternity upon its entry to the Japanese mainland and then its subsequent exposure to the wider world. I truly believe that these opinions are shared by many an experienced Shotokan karateka but their business brain and a need to pay the mortgage has the effect of keeping them quiet when it comes to this subject. 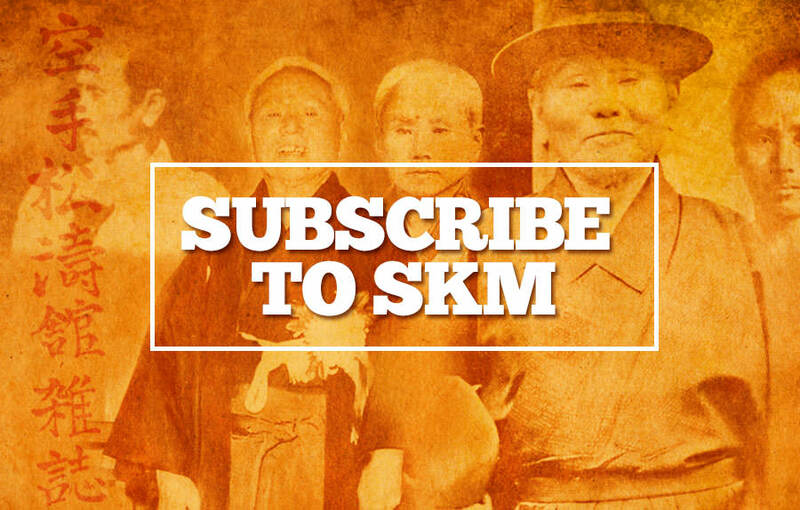 It is, I believe common knowledge within the wider Shotokan world that our founder Sensei Gichin Funakoshi disliked the idea that his beloved brainchild be practised as a sporting activity. For the average person, this I think is a hard opinion to understand. Is it not true that it is through the practise of sport that human beings reach the highest pinnacle of achievement? My personal take on this subject is that sport is fine for the young but to base a subject such as karate-do on sports, when as all its founders stated “karate-do is training for life” is actually just about paying lip service to their words, almost as if they were simpletons, and people from a bygone age. Sporting activities have sporting heroes, by their nature they are young and lap up the adulation and glory that comes from their efforts. This is all well and good when what we are talking about is a sport such as tennis, cricket, or even boxing but when it is an activity such as karate-do, which is intended to strengthen, and deepen the trainee’s nature whilst giving them a good level of control over their ego, personally I am not so sure. As I stated, maybe this is hard for the average person to understand, but should ideals be dictated by average people? Again, only my personal opinion when I say, probably not. This is not directly what this article is about but it does have a connection. As a footnote to this section I just want to say that it is through this kind of dumbing down of our beloved art form that we have the natural progression into the MacDojo type of Karate school that is at present decimating martial art classes across the UK. It is I am afraid the dumbing down of our style of karate through the need for young people to look good whilst displaying their Shotokan karate, particularly kata that has been on my mind for a while. For me kata is the soul of karate. An individual that simply wants to do kumite and pay again lip service to kata is in my ever-humble opinion not actually doing karate, just exercising their ego. I was recently re-reading Dr Clive Layton’s book on Mitsusuke Harada, entitled Karate Master. In this book sensei Harada was alluding to the phenomena of when a karate student trains only kumite all other aspects of their karate devolve whereas if they train only kata all skill sets are kept intact. As I am damn sure someone of worth and renown stated “karate is kata and kata is karate”. Shigeru Egami (circa 1936/37). Taikyoku shodan uses only two techniques, gedan barai–oi tsuki. It is the first kata, that of Kihon or basic kata that I wish to bring to the fore in order to make my rather depressing case for my opinion that Shotokan karate-do has been dumbed down to an almost unbelievable level. Now this kata was either designed by or was a favourite training tool for no other than Sensei Funakoshi’s third son Yoshitaka. Now, those that knew and trained with Yoshitaka, such notables as Senseis Kase, Harada and his senior Sensei Egami always stated that the young Funakoshi’s skill level was “phenomenal”. Many readers will I am sure be aware that there was an older, and in my opinion (there you go I have got another one) wholly more appropriate one in the days of the Funakoshis. This Original name was Taikyoku shodan. There were originally between three and six kata in the Taikyoku series depending on where one reads but only the framework of the first has survived in the Shotokan style of karate. It was intentional for me to refer to the modern interpretation of this kata as a ‘framework’ of its older sibling as for me this describes it well. Again, depending on where you read it, Taikyoku shodan can either mean kata of the first cause, or I think more appropriately; kata of the first cause of the universe. I think most would agree that there was a definite dumbing down of the name, even if they don’t agree with the rest of this article. It was not until I began to do a bit of research for this article that I discovered that the Chinese kanji for Taikyoku is actually spelt and pronounced as Tai Chi. This was, I have to say, a very pleasing revelation for me and very much bares out my premise for this written piece. I am afraid I am going to do a bit of Nakayama bashing. I am sure he was great man but I don’t personally like his notion of Kime or focus. I think his style of karate-do was Okinawan karate mixed with western sports science. Like oil and water, I don’t think they mixed well. Maybe when teaching predominately young men at university who want to look good and develop a strong athletic build, his blueprint worked well but in the wider world where karate students as Funakoshi obviously wished when he stated that “karate is for everyone” come in all shapes and sizes, this method of power development is maybe not the best. So why do I think that Kihon kata is simply the framework of Taikyoku shodan? There is a clue in both the English translation and the Chinese kanji I think. Firstly, first cause of the universe. What can that mean? Again, only my opinion when I state that to me this is a reference to that oh so useful phenomena if one is a Martial Artist, being that of gravity. One stance, a downward blocking action, pulling or throwing motion and one middle level, right on the button punch. The framework of Kihon kata holds up Taikyoku kata, but in truth it does not want holding up, it needs letting down. This for me is the problem of modern kime as propagated by Sensei Nakayama, it keeps the karateka’s body weight away from the ground. Soft absorbing legs, body in free fall until the last instance just to stop from falling into the opponent is how I think Yoshitaka would have practised his forms. Secondly, the Chinese kanji for Taikyoku being that of Tai Chi and how this contributes to my belief system regarding all Shotokan kata and form. I have for a couple of decades or more trained in and subsequently taught Yang Family Taijiquan (Tai Chi Chuan). I have to say that Taikyoku shodan kata does not resemble Tai Chi in any external way. It seems quite obvious to me that it was the principles contained within this rather fundamental form that both Funakoshi’s had in mind when they formulated and taught this kata. In good, classical Taijiquan all connective tissues (basically anything wet within the body) sinks using gravity. It is through this method that we find the strange phenomena such as ‘fajin’. Could this have been the elusive skills that Yoshitaka was trying to find in his sadly brief lifespan. We will probably never know. It is obviously true that a novice karateka does not have the ability to utilize the gravitational pull of planet earth when learning and executing their techniques and kata, but an expert in their art certainly can. I think it was for this reason that our styles originator wrote that this very technically simple form was the ultimate training tool. It is a rare thing in this modern time I feel, for a person to train themselves in order to manifest the best possible version of themselves they can achieve in one lifetime, rather than attempting to glorify themselves. For me this lies at the heart of what some would call Budo karate. Me, I just think that this was what Sensei Gichin Funakoshi had in mind when he was instrumental in adding the suffix ‘Do’ to the karate that he taught. Well these are some of my opinions, maybe let me know yours on the subject. Author: Paul Mitchell 5th Dan Senior Instructor – Traditional Shotokan Karate Association (TSKA). Senior teacher – Lotus Nei Gong International Grade ‘A’ teacher – Tai Chi Union Great Britain. Harada and Egami stated that Yoshitaka Funakoshi’s karate ability and skill level was ‘phenomenal’.